So the 40 year War on Drugs is a failure,go figger. It only cost The People $1 trillion dollars. But look at it this way: It's only 1/12 of the National Debt and surely your succesor, i.e. children and grandchildren will be glad to work hard to pay off the debt. After all, it's what's best for society. Now, for the Agent of the State that view this website, We know Big Brother is watching us, and conversly, we're watching Big Brother, because we LOVE you TOO! The majority of the $1 trillion goes to vested interests that DO NOT want the money flow to stop. Everyone involved-police departments, drug agencies, bail bondsmen, the judiciary, lawyers and district attorneys, jails, prisons, and probation departments-they've all been sucking up the money. Just as with Prohibition, this war will not end until citizens (taxpayers) vote the politicians out and say enough in a clear loud voice. It succeeded! 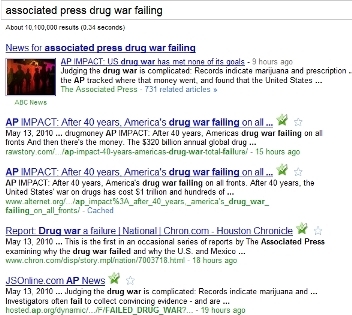 Through all those decades the "War on Drugs", actually mainly War Against Cannabis, succeeded in protecting and prolonging the Big 2WackGo empire which makes almost a $trillion a year genociding 6,000,000 poor puffsuckers a year for profit (and the WHO says the death figure is going UP as teenagers in China and India are bombarded with messages about what to do with their increased purchasing power i.e. buy more $igarettes). If cannabis had been legal, possibly near all of those addicts would have either (a) switched from tobackgo to cannabis and other herbs or (b) from hot burning overdose $igarettes to vaporizers, one-hitters and other low-dosage equipment which have long been risky to own because some nark will accuse you of associating with illegal cannabis. Some may be annoyed that we keep bringing this old stuff up; question is what to do. Answer: it's the money! Do whatever it takes to break the financial (i.e. government-bribing) power of the hot burning overdose $igarette industry, which has funded cannabis suppression till now. * Promote vaporizers, one-hitters, e-cigarette, smokeless, anything that smokers can dosereduce down to away from the cash cow "$igarette" format "from whence their profit cometh". * Read wikiHow "How to Make Smoke Pipes out of Everyday Objects" and supply long-drawtube screened one-hitters to your neighborhood. * Swarm out as Jah's Witnesses across the planet serving demonstration mini-tokes of sifted alfalfa, basil, camomile, damiana etc. or even a 25-mg. pinch quickly torn from the as yet unlit tip of someone's actual 700-mg. overdose nigotine $igarette. * Urge the President to serve e-cigarettes instead of beer at summit conferences. Thanks, everyone, even John Walters, for your attention. Now get bizzy! but it is a wrong conclusion on your part. The tobacco companies are not at all concerned about cannabis. They are the one business that is prepared for legal cannabis, they have the equipment up and running, already, to fashion cannabis cigarettes and the lands and greenhouses to grow it. Not that I would buy such a product from them, myself, I'd be afraid the product would be adulterated with unwanted and unhealthy chemicals, as they already do with tobacco. Also, I don't know anyone who would stop smoking tobacco and switch to cannabis, many people smoke both, and if they don't, there is no reason to believe quitting one will cause them to turn to the other. Oh well, we didn't really need that trillion for anything else, it was pretty much disposable income. Same goes for those American lives that were destroyed or damaged by the drug war, disposable. Americans that can't follow government orders don't deserve freedom. Why does not government legalize marijuana? Because this would be the sane thing to do! Glad you're not annoyed. No I'm not counting on converting the nigoslaves to cannabis, rather let's work on converting them to low-profit e-cigarette, vaporizer etc. Point is to take down the $400-bil.-a-year chronic overdose $igarette marketing system because that's the major factor, even more than fHARMa, in tax-funding government crackdowns against our herb. that pushes law enforcement, eradication, and interdiction, follow how the budget-pie is being sliced up and where the money goes. Look into who is benefiting most from maintaining the status quo. aerospace industries, all of them set on not giving up their slice of the pie. These interests spend lavishly year-round on wooing their political partners. (Think corporate Gulfstream jets & Hawaiian resorts) They are partners in bed together in perpetuating this failed policy. The sad part is that money is still the Ultimate Aphrodisiac, and it is ultimately what career politicians will get on their knees for. want to really change things?